When the city of Springboro needed to upgrade one of its main constant pressure water systems, Control Interface built a custom pump control system utilizing Allen Bradley drives, programmable control, and radio communication to interface with their existing SCADA system. Control Interface was on-site to insure the changeover went smoothly with no interruption to those relying on the water system. This project helped the city see the extent of our capabilities. We continue to play a key role in their growth through updating the SCADA system utilizing Rockwell and Wonderware software solutions. When Hurricane Hugo ravaged the South Carolina coastline and surrounding areas, Control Interface worked for weeks with local clients. We provided constant phone support well into the evening hours assisting technicians with bringing damaged pump stations back into operation. Our service continued with the construction of replacement panels and expedited delivery. Many of the municipalities and engineers affected come to us for help in the development of their standard specifications. McCord Pane needed a method for eliminating the volatile gasses generated from their head gasket manufacturing process. 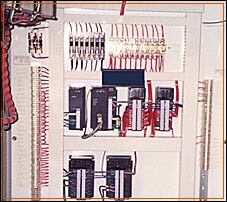 Control Interface developed a programmable control system which monitored these LEL (Lower Explosive Limit) levels and interfaced with an ABB incinerator to burn off the gasses and maintain a safe environment.